Sorry this is going to be long! When we registered for our duathlon, I felt like it was so far away that I wasn't even nervous about it. It wasn't until Thursday and Friday that it hit me that Mike and I were going to actually become multi-sport athletes. Sure we have been training for our triathlon over the past three months, but it doesn't feel real until you actually race in a multi-sport event. At least in my opinion! Our day started bright and early at 6am yesterday when we woke up to get ready for the Spring Classic Duathlon. The race was started at 8:30am but the transition area opened at 7:15am and we wanted to get there as early as possible since we had never set up for transition before. We were a little bit confused about how to set up our bikes. Most people had them hanging from the racks by the seat but a few had them hanging by the brake levers, we decided on the latter and hoped that it was fine. We didn't have much else in our transition area, just a bright colored towel to put our stuff on, a water bottle, energy gels and our helmets. We only wore one pair of shoes, our trail running shoes, so other than that there wasn't much else we would have needed anyway. 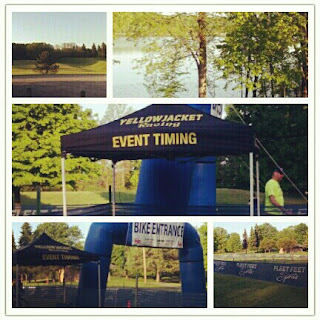 The transition area closed at 8:25am and the Formula 1 Duathlon started at 8:30am with the Super Sprint following shortly after at 8:35am. Mike and I did the Formula 1 distance so we had a long day ahead of us! Right before 8:30am we lined up at the start and waited for the announcer to get us started. At the prompt of a really long "GOOOOOOOOOOOOOOOO" (seriously it went on forever), we were off! There's Mike in the back in the green shirt! The first leg and the final leg of running were on the same course. We had to run along the grass from the start and continue along a trail through the woods. After running along a trail for awhile, we ran on the road for a few tenths of a mile, then continued through the trail and then onto the grass back to the transition area. At about .45 miles there was a water stop (where we would turn around during the second run leg) and we were able to run by it twice on the longer running legs. I took water every time except for the first time I ran by it. 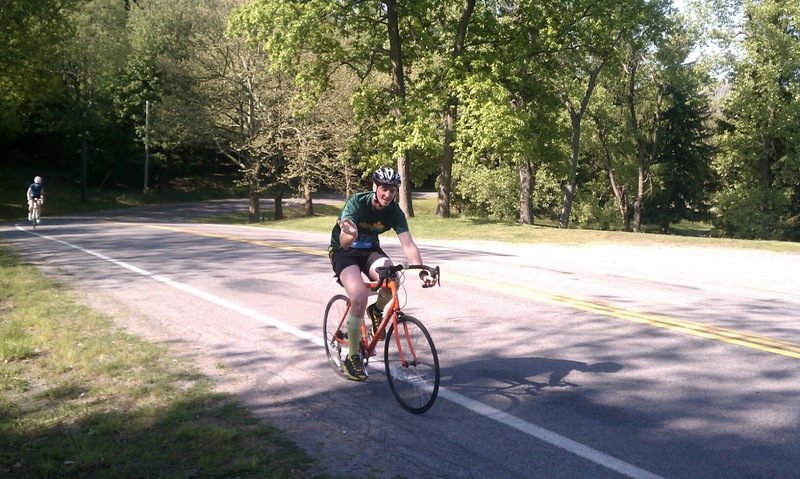 I felt pretty good during this leg but I tried to stay conservative because I still had 23 more miles left. The hills were pretty steep but I ran this entire leg and I was in the middle/back of the pack. 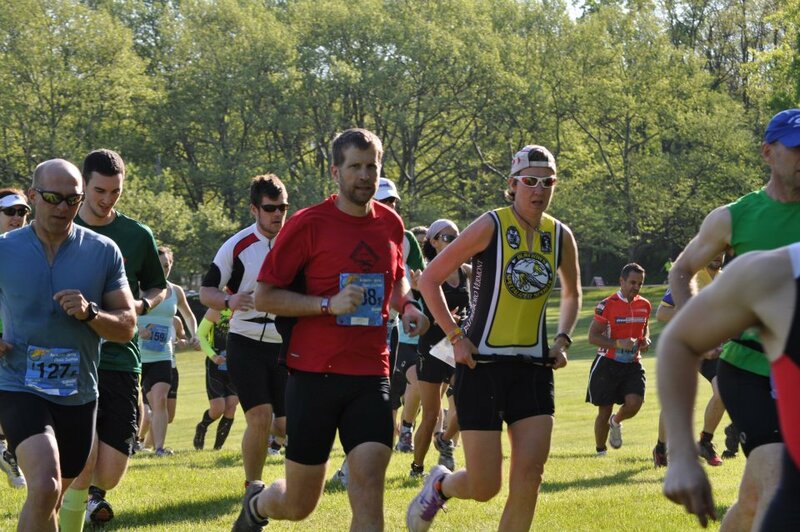 I do know that some Super Sprint people had caught us at this point! In addition to having water on the run course, there was also water at the entrance/exit for the run in the transition area. Right before getting on the bike, I took some water and dumped it over my head. This ended up being a bad idea because I got some on my watch and then it was finicky during the transition. I wasted some time getting my watch to change from running to biking. 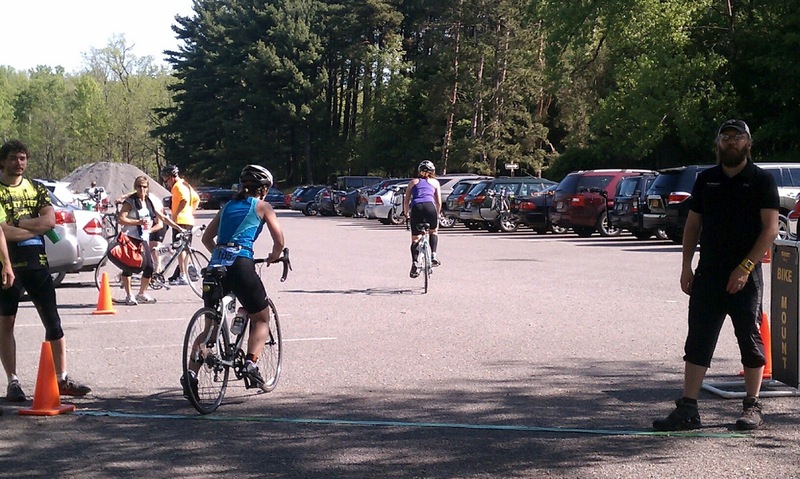 As soon as you left the transition area and got to the mount line, you had to leave the park through the parking lot and up a hill to the main road. 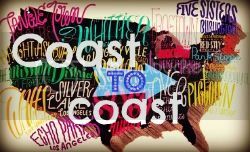 Mike and I had already driven the course so we knew what to expect on the two bike legs. Right at the first mile we both got a nice surprise because two of our Seneca7 teammates, Sarah and Mark, and Mark's parents were sitting on a picnic table waiting to cheer us on! It was so nice to see them and it gave me the boost to keep going. 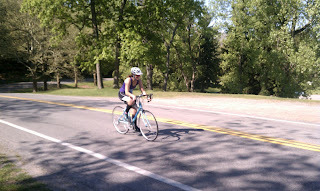 I definitely got passed a lot during the bike leg, but I tried not to let it discourage me. The course was pretty hilly and I just focused on powering up the hills and taking advantage of the downhills. 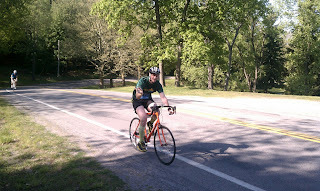 I saw our cheering squad again around 9 miles on one of the last hills. I think I heard Mark's dad saying, "she's still smiling!" As soon as I got off of my bike and started running it into the transition area, I slammed one of the pedals into the back of my left ankle. I didn't even bother looking at it, but later we saw that I had bled and had bruises in two spots. Since we don't have water bottle cages on our bikes yet, we do have them though, our plan was to hydrate during each transition. The extra water on the run course helped too! I was so happy that this leg was only 1 mile! Not like I really wanted to get back on my bike that soon after running but I was still welcoming the brief run leg. I hit the trails again and tried to run as fast as my legs could go. Once I turned around at the water stop and got back to one of the hills, I had to stop and walk. Lots of other people were too (at this point there were still people around me since the Super Sprint people were finishing up their final leg of the day). 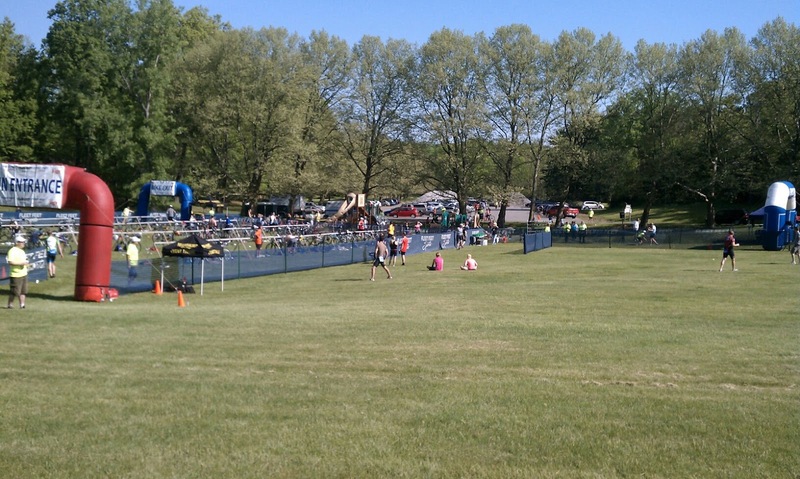 Instead of running down into the finish like all of the Super Sprint people, I went down into the transition area again. I saw Sarah and Mark, the last time I saw them, and took off down the hill. 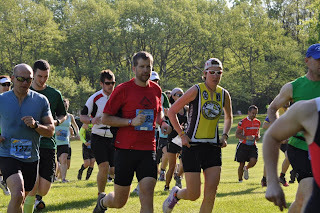 It was at this point that I took one of the energy gels that I had brought. I only ate about half of it because it was boiling hot after sitting in the sun for an hour and a half or so. There was only one other woman that I saw getting on her bike at this point and I just took off as fast as I could ahead of her. See ya after 10 miles! Well, my lead on the other woman didn't last very long and she passed me shortly after we left the mount/dismount area. I had this feeling that I was in last place but I tried not to let that bother me. The entire ride was completely alone, except for when I could still see the other biker ahead of me, but the volunteers did a great job cheering me on. Mike rocking it on the bike! I saw a family of geese down a side road around 6 miles of this leg. The babies were so cute and fluffy and the parents were honking so much that it sounded like they were cheering for me! One negative part of the final bike was that you could see runners along the road finishing up their final leg (this didn't happen the first time because the 1 mile run leg didn't go out to the road). I had no idea how Mike was doing so I tried to see if I could see him, but I didn't. 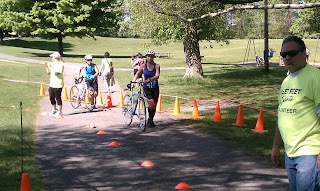 I made the final turn on the bike back down into the transition area and I had 23 miles under my belt. Only 2 more to go! I ran as fast as I could into the transition area, racked my bike and switched my watch mode while running to the run exit. I didn't want to waste any more time! 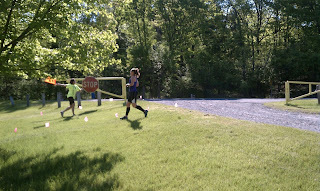 As I ran across the grass and into the woods, other runners were heading back toward the finish. I just focused on getting through as much as I could without walking since my legs were getting tired. As I approached the water stop I saw Mike! I did say to him that I was basically in last place and headed on my way. As I went into the woods, I saw the woman that passed me on the bike! I focused on pushing as hard as I could and as we headed out to the road, I passed her! We cheered each other on and headed back into the woods. 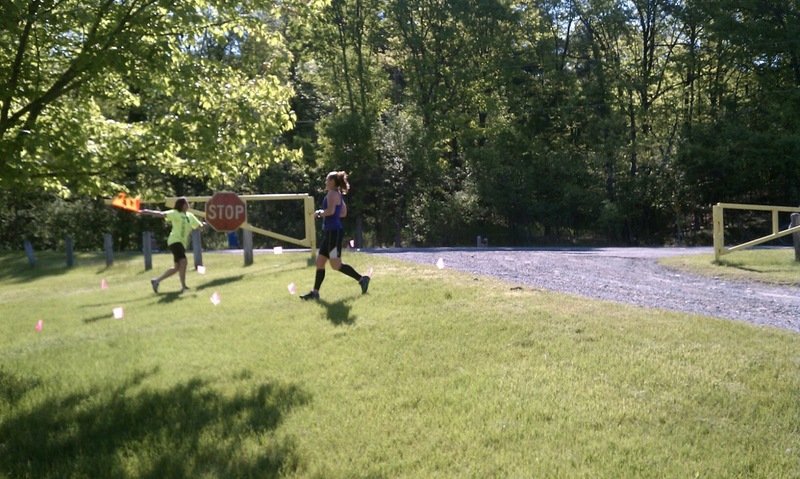 As I passed the water stop one more time and got onto the grass, I had to stop and walk for the first time. For about five minutes I alternated between running and walking a few steps. I did look back to make sure the woman was far enough behind me and then walked up the worst hill. Mike later said that he walked a ton the last run leg, which explains why my time was slightly faster than his. As I ran across the grass and down toward the finish line, I heard the announcer say, "way to go with a strong finish, here comes Jamie". I saw Mike on the side cheering me on and ran through the finish! We were officially duathletes! So happy to see this at the end of the run! Out of 87 people who finished the Formula 1 distance (not including 6 people/teams who DNF), I came in 85th and Mike came in 78th. In the end we realized that we probably should have done the Super Sprint because very few beginners did the Formula 1. However, we finished and are stronger for doing it! We also realized that we need new bikes, so many people passed both of us (and we didn't pass anyone) because of the advantage their equipment gave them. 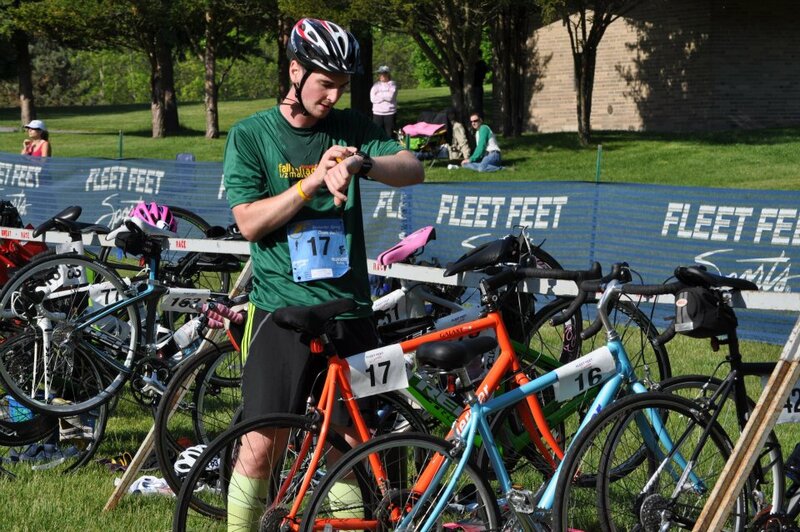 The bikes we have now are great for starting out, but we will need to upgrade as we start to do endurance triathlons! Finally a huge, huge, huge thank you to Sarah, Mark and Mark's parents for coming out and supporting us! It really made a big difference and it made us feel so good to know we had people there for us. I loved reading every bit of this. I am sooooo freaking proud of you both. You totally rocked it Jamie. I wish I could be there to cheer you on. I'm highly impressed by your skills. Thanks for the continuing inspiration. Thank you so much Crystal!! I know that we will both just continue to improve! I can't wait to meet you in October! I'm impressed that y'all went for the Formula One distance - you should be so proud for finishing as some of the only beginners!! Definitely inspiring me to race again soon. Congrats Jamie (and Mike)! Thanks Leah! We didn't even think that Formula 1 would be that much harder, but now we know that we can accomplish our triathlon since it is significantly shorter! It sounds like you guys had a great day! Congrats! It was definitely a great experience! Thank you! Great job at your first multi sport event. It sounds like you had a alot of fun. Just a small fyi at your next event you will want to rack your bike with the seat on the rack :) also get some water bottles for your bike it will really help with fueling properly. 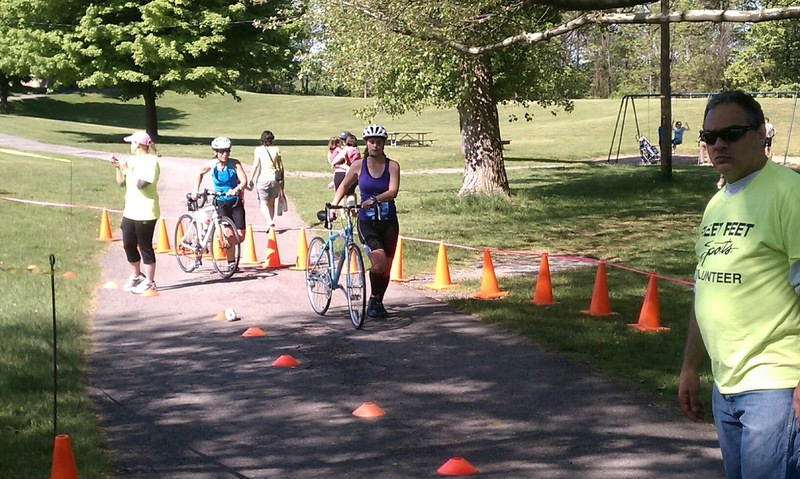 This was very similar to my first duathlon (in April). I did the "long course" (1.5 mi run/15 mi bike/3 mi run - so shorter than yours, but longer than the folks that did 1.5/7.5/1.5) and came in 2nd to last because at a relatively small race like that - only the "speedy" and "experienced" folks did the long. Definitely something to be proud of!! A little more time in the saddle and more brick workouts help a lot too. You ROCK!!!'n. congratulations on dominating your first multi sport event! I've never read about a du like this with so many transitions - lots of time to practice transitioning. It sounds fun! Thank you Ricole!! The event was really long, haha, but if we had done the Super Sprint we would have only transitioned twice. 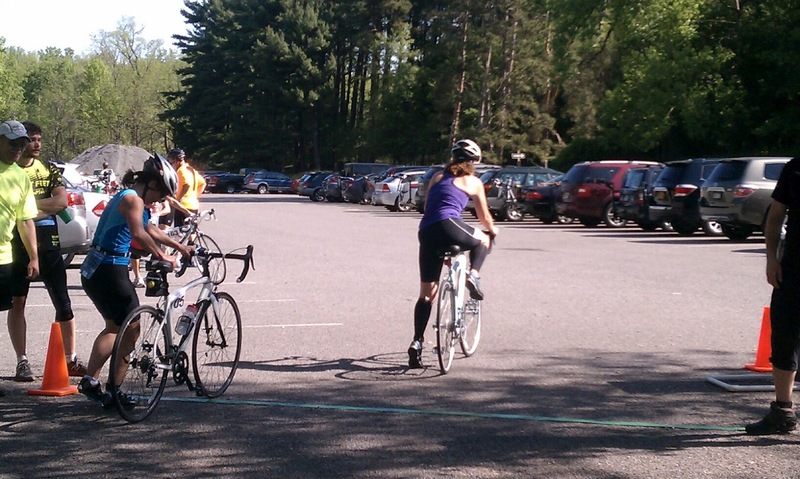 However, we did this race as a warm-up to the triathlon so it was great practice! I would definitely recommend trying a duathlon first if you aren't a strong swimmer! We are but it was still a great transition to the triathlon. Way to go Jamie! Great recap. Thanks Jenny!! I still can't believe we actually did it! Both of you really sound like you had a great time doing this, and it seems that your biking skills and strength is improving steadily. Congratulations to you both...you're not multi-sport athletes ! It was a lot of fun! I think that our paces were a little bit slower than our fastest rides but the course was pretty hilly! It is exciting to be a multi-sport athlete! Thanks Kari! We both agreed that the triathlon is going to be MUCH easier! It's about 10 miles shorter! Haha I would LOVE to finish my Ironman in 14 hours. I guess in 2014 we'll find out! Congratulations!!!! That's a lot of transitions! WTG! Congrats to both of you!! What a great experience... you're going to keep getting stronger, and I'm sure you're picking up all sorts of tips and tricks at each race. I definitely need a new bike before I attempt a tri, but I'm hoping to find a decent used one. We'll see! Congrats to both of you! that sounds like quite a duathlon adventure! Well done! Thanks Marcia! It was definitely an adventure! 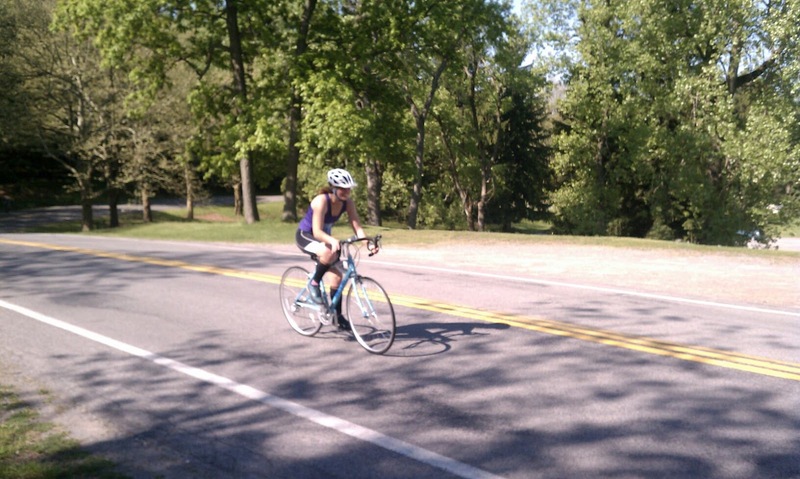 I've chickened out of 2 duathlons this year - I'll get there one of these days - the transitions freak me out. 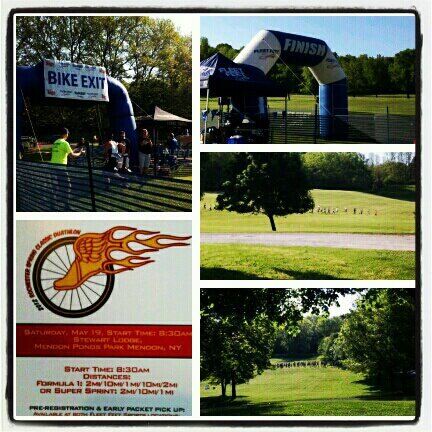 Nice job on the duathlon! So this one was 20 miles biking and 5 miles running? That's impressive! Thanks Suzanne!! It was a long race!